King Bhagvatsingh was the ruler of the Gondal state of Gujarat, from 1865 to 1944. He was the only Maharaja to take a medical degree and other degrees. H.H. 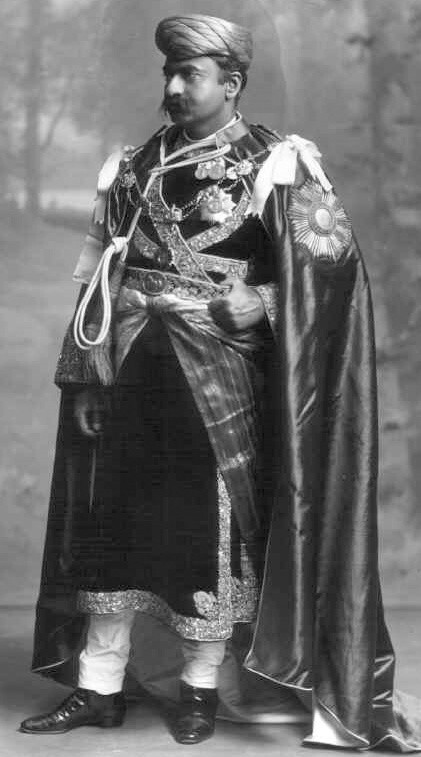 Maharaja Thakore Shri Sir Bhagwat Singhji Sagramji Sahib Bahadur, Maharaja of Gondal GCSI, GCIE, a 1911 photograph, during his visit to London, for the Coronation of King George V.
He reformed the state administration, developed its resources, erected schools, colleges and hospitals, provided free and compulsory education for both men and women through university. He also published the first ever dictionary of Gujarati and a Gujarati encyclopedia, the “Bhagavadgomandal” in 1928. Once during his reign, he built a very big clock tower near one of the school and summoned engineers from England to install the clock into the tower. It was a mistake, I am so sorry for that, The teacher said. You have damaged public property and you will be punished for that, as a punishment you won’t get your salary of 3 rupees for next month, The king said. The teacher started leaving with disappointment of not getting salary for next month. What kind of ruler I would be, if I don’t appreciate a good cricketer in my realm who hit a ball so high that it smashed the clock tower’s glass. You will get 6 rupees for the next two month from king’s treasure as appreciation. If you scold a person to make sure that he won’t do the same mistake again, also appreciate him for his good deeds to make sure that it will happen again and again.